SomePublisher | not just another publisher! We are a small publisher striving to provide the best experience to our readers. Independent from the ground up. Christmas is the time we call the most beautiful time of the year. 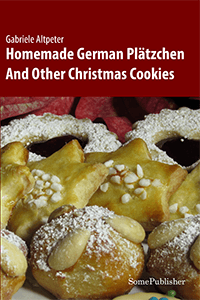 The book Homemade German Plätzchen: And Other Christmas Cookies wants to invite you to go on a journey through a happy and joyful Pre-Christmas and Christmas period. Allow yourself to take the time to bake these homemade Plätzchen and smell the scent of the festive spices. The author has baked each and every one of the German Plätzchen, carefully describing and explaining all the required steps. The cookies were photographed the way they actually turned out, there is no cheating. The cookies introduced in this book had to withstand the most blatant of all critics – the author’s sons. And as every mother or father will know, they don’t hesitate to voice their opinion. All ingredients are given in this book, all that’s missing to really make it perfect is YOU. Enjoy baking these delicious German Plätzchen!